The item for sale is a set of five (5) replica costumes worn by characters in “The Greatest Showman” film played by Hugh Jackman, Zac Efron, Michelle Williams, Rebecca Ferguson and Zendaya (Sale Item). The Promoter of the Sale Item is Nine Network Australia Pty Ltd ABN 88 008 685 407 (“Promoter”). The third-party provider of the Sale Item is 20th Century Fox Home 77 002 412 679 (“Supplier”). Your participation in this auction constitutes acceptance of these Terms and Conditions. 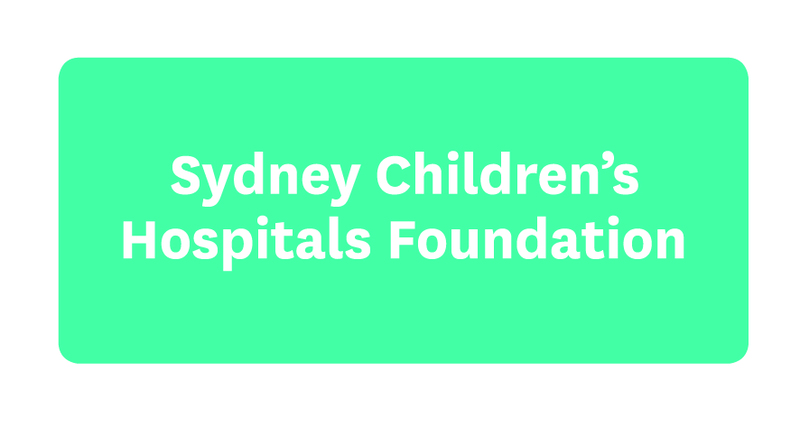 The Promoter is conducting this auction with the permission of Sydney Children’s Hospital Foundation ABN 72 003 073 185 to fundraise (“Charity”). The auction is only open to Australian residents aged 18 years and over. The Promoter may, at any time and in its reasonable discretion, conduct further screening of bidders, including requesting additional documentation on a bidder’s ability to make payment or a bidder’s location. Only genuine bids and bidders with sufficient funds to purchase the item (at the highest amount that they choose to bid) are allowed. The Promoter reserves the right to reject a request to bid or to cancel already approved bids in its sole discretion, acting reasonably, where it believes a breach of these Terms and Conditions has occurred. The Promoter’s decision regarding any aspect of this auction is final and no correspondence will be entered into. To the extent permitted by law, the Promoter shall not be responsible for any bid that is not processed due to technical problems or delays. (e) It/he/she did not rely on any representations made by the Promoter other than as made in these Terms and Conditions. The auction will commence at 09:00am (AEST) on Monday 11 June 2018 and conclude at 3:30pm (AEST) on Monday 11 June 2018. 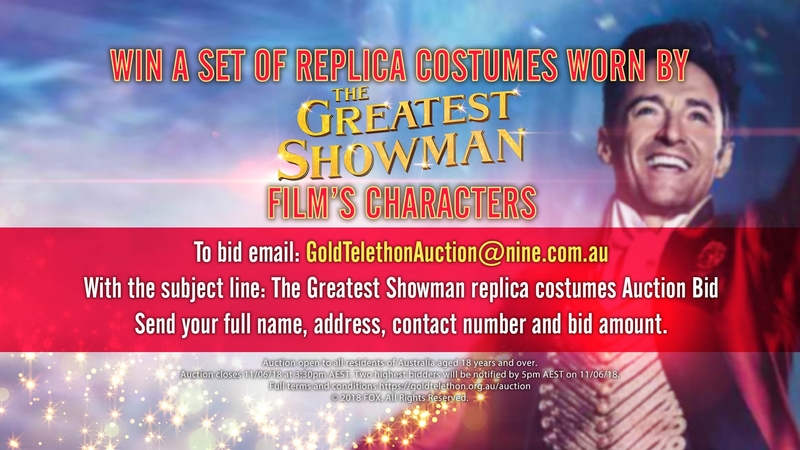 To bid, the bidder must send their full name, address, phone number and bid amount to goldtelethonauction@nine.com.au with the subject line: “The Greatest Showman replica costumes Auction Bid”. (c) charge the Buyer for, and the Buyer must indemnify the Promoter from, all costs and expenses (including without limitation all legal costs and expenses) incurred by it resulting from the default or in taking action to enforce compliance with these Terms and Conditions. Following cleared payment, the Promoter will announce the Buyers during its live broadcast of the Gold Telethon on Monday 11 June 2018 and the Supplier will arrange for the Sale Item to be delivered to the Buyers to the address provided with the Buyer’s winning bid. Subject to clause 14, payment for this item is non-refundable. If the Sale Item is unavailable, the Promoter and/or the Supplier, in their absolute discretion, reserve the right to substitute the Sale Item with an alternate item to the equal value and/or specification, subject to any written directions from any relevant regulatory authority. Bidders accept full responsibility for their decision to participate in this auction and hold the Promoter, Supplier and their agents harmless from any loss, injury, damage, cost, liability or expense suffered or incurred by a bidder in connection with this auction or the Sale Item. As a condition of accepting the Sale Item, the Buyer must sign any legal documentation as and in the form required by the Promoter, Supplier and their agents in their absolute discretion, including but not limited to a legal release and indemnity form. If for any reason the Buyer does not take the Sale Item at/by the time stipulated to them, then the Sale Item will be forfeited and will not be redeemable for cash. No compensation will be payable or alternative item provided if the Buyer is unable to take the Sale Item as stated and provided. All proceeds from the auction of the Sale Item (excluding any merchant fees or charges) will be shared equally to the charity and paid by the Buyer directly to the Charity in accordance with the Charity’s instructions during the Verification Process. The Australian Taxation Office has ruled that donations are not tax-deductible if a person receives goods or services in return for the money given (e.g. the purchase of any items or experiences). For further information, visit the Australian Taxation Office website. Bidders should rely on their own independent financial and taxation advice prior to placing a bid. Nothing in these terms limits, excludes or modifies or purports to limit, exclude or modify the statutory consumer guarantees as provided under the Competition and Consumer Act, as well as any other implied warranties under the ASIC Act or similar consumer protection laws in the States and Territories of Australia (“Non-Excludable Guarantees”). Except for any liability that cannot by law be excluded, including the Non-Excludable Guarantees, the Promoter (including their respective officers, employees and agents) is not responsible for and excludes all liability (including negligence), for any personal injury; or any loss or damage (including loss of opportunity); whether direct, indirect, special or consequential, arising in any way out of the auction or the supply of the Sale Item (including but not limited to the Buyer’s or any other person’s assembly or acceptance/use of the Sale Item). If this auction is interfered with in any way or is not capable of being conducted as reasonably anticipated due to any reason beyond the reasonable control of the Promoter, including but not limited to technical difficulties, unauthorised intervention or fraud, the Promoter reserves the right, in its sole discretion, to the fullest extent permitted by law, to modify, suspend, terminate or cancel the auction, as appropriate. To the extent permitted by law, the Promoter is not responsible for any errors or omissions or for any warranties or guarantees either explicit or implied herein including the quality, safety, or legality of the Sale Item, the truth or accuracy of the listing or the ability to provide the Sale Item. The personal information you provide may be collected by and disclosed to the Promoter. The Promoter may use this information to conduct this auction and provide the Buyer with the Sale Item. If you have consented, the Promoter may also contact you with marketing material that may interest you in the future. For these purposes, the Promoter may also disclose such personal information to third parties, including but not limited to agents, contractors, prize suppliers and service providers. Participation in the auction is conditional on providing the requested personal information. Personal information collected from entrants will not be disclosed to any entity located outside of Australia. No part of the content of this auction or associated pages (including photos, video, text, design) may be used without the written permission of the appropriate license holders.